Mmmm, red lentils. They have become a staple around here, as they contain a good boost of protein, taste delicious, and cost so little! 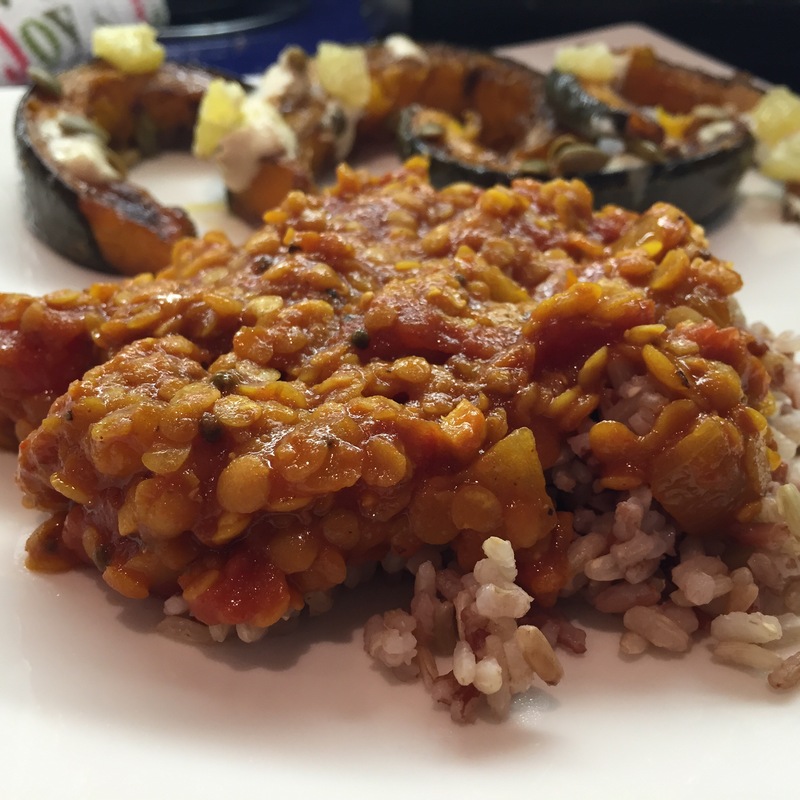 I made these red lentils on the same day as my Roasted Squash with Tahini and Lemons, so that I’d have a protein course along with my veggies. I served them over vanilla-scented Volcano Rice, right alongside the squash. And the next night, I served them over pan-fried polenta (with goat cheese), topped with a soft-poached egg with a runny yolk. Magic, and perfect for a dinner party! I love the Indian spices here, and I love the spiciness, but you can tone it down by using less cayenne. You’ll still get lots of flavour from the garam masala, but not so much heat. I often make my own garam masala spice blend, but I must admit to cheating while traveling last summer and picking up a pre-made blend. I’ve been using it in all my curries, and I really do enjoy the balance of spices. In these lentils, I added some extra ground turmeric and ginger; I often also add extra cardamom to pre-made blends. Normally I cook my lentils in lots of extra liquid, until they’re totally mushy, but I really like the texture of them this way, cooked in just the liquid from the can of diced tomatoes. My favourite way to eat these lentils? In a bowl, by themselves, topped with just a scoop of Greek yogurt and a handful of fresh cilantro leaves. Perfection. If you want to keep these Indian-spiced lentils vegan-friendly, just omit the butter. The spicy lentils won’t be quite as creamy, but they’ll still be spicy, savoury, and delicious! Inspired by Spiced Red Lentils from Plenty by Yotam Ottolenghi, serves 6. Begin by preparing the lentils: rinse the lentils until the water runs clear, and drain well. Cover with fresh water and soak for 30 minutes. Drain and set aside. Once the lentils are ready, place the mustard seeds in a heavy-bottomed pot over medium heat. Once the seeds start to pop, add the grapeseed or coconut oil, onion, garlic, and ginger. Saute over medium heat until the onions soften and then begin to brown. Add the spices (garam masala, paprika, turmeric, cayenne, and salt) and stir well to coat the onion mixture with the spices. Add the drained lentils and the diced tomatoes, and stir to combine. Bring to a boil over medium-high heat (stirring right down to the bottom of the pot so you don’t burn your lentils), then turn the heat to low and cover. Simmer for 15-20 minutes, until the tomatoes cook down into a sauce but the lentils are still whole. If you’re using it, stir in the butter for extra creaminess.